Using SimProject students learn the fundamental tools and techniques of planning and managing a project from beginning to end. Good project managers understand how to use a Project Charter, Work Breakdown Structure, Network Diagram and Gantt (Bar) Chart in both planning and managing a project. With SimProject students learn what managing a project is like as they make real decisions and get real feedback as they manage a simulated real-life project using real-life people within a real-life company. The simulation powered learning is practical, engaging, intense and challenging. It’s designed to give students the practice and confidence they need to apply their new skills on the job. This simulated project consists of 7 tasks spread over 11 weeks (iterations) with 10 potential team members to staff the project. A SimProject purchase includes three runs or complete executions of the simulated project. Your license begins when you register your account and expires 120 days later (even if all runs are not completed). Ignore the ship to a different address option as there is nothing shipped with your purchase. To access SimProject through a firewall, you have to allow http://www.simproject.com. Upon purchase and validation, you will receive a confirmation email and a second email (from spl@simulationpl.com) with important links, login and account setup information. If you do not receive your registration email within a few minutes, CHECK YOUR SPAM folder! SimProject works with all the major browsers on most platforms. SimProject does not run on Internet Explorer. Click on the login link in the registration email. Your computer will be loaded with the communication software to run the simulation. You will then see a Login screen. Once you have logged in, you will be asked to set your own password. After setting your password you will see an Introduction screen with a checklist to assist you in getting ready to run the simulation. As part of this process you will be asked to pick an instructor (pick your instructor), and then pick your classroom. Remember to refer to the Information panels on each page for instructions specific to that page. Use the Help documentation via the icon in the navigation bar (top right of your screen) to read about planning, and executing your project. When ready click on “Start New Project”. You can log out at any time – it will save where you are. You will not be able to start your second or third execution until prior execution projects are completed. 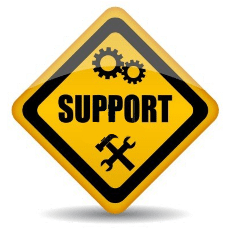 Technical support is available during regular business hours (Eastern Time zone) Monday through Friday. Send support emails to support@simulationpl.com.